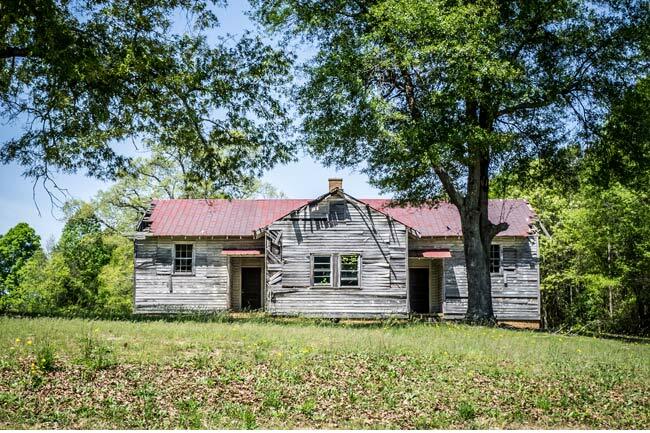 This dilapidated schoolhouse in Townville is referred to as Queendale School in the Geographic Names Information System (GNIS), a database of national geographic features developed by the United States Geological Survey. However, its actual name was likely Shiloh School. It is not to be confused with a nearby Shiloh School in adjacent Oconee County nor another Shiloh School in lower Anderson County. The school sits next to a church, also called Shiloh, and a Shiloh School at this location is listed in the South Carolina Department of Archives and History database of South Carolina Rosenwald Schools. However, though it is in the database, a note by that entry states that the school was not recorded as a Rosenwald School. Thus, this school remains a bit of a mystery. Rosenwald Schools were schools built in the rural South for African-American students. The schools received financial support from Julius Rosenwald, then the president of Sears and Roebuck, and were designed to maximize natural light and ventilation. Between 1917 and 1932, more than 5,000 schools were built across the South with the help of Rosenwald funds. Members of the communities where the schools were built also contributed towards the schools, and many of the schools were strongly supported by churches. Such schools were subsequently named for these churches, lending credence to the name “Shiloh” for this school, which rests next to Shiloh Baptist Church. The school building is very similar in structure to a Rosenwald style known as the Nashville Commuity School Design. However, as contributor Tom Taylor notes, the school lacks some features of the design, including tall windows to allow for maximum light. The entry for the Shiloh School in the South Carolina database of Rosenwald Schools says that it was built between 1920 and 1930.